Join us for an extraordinary look into the rich history and breathtaking artistry of New York's most famous landmark! 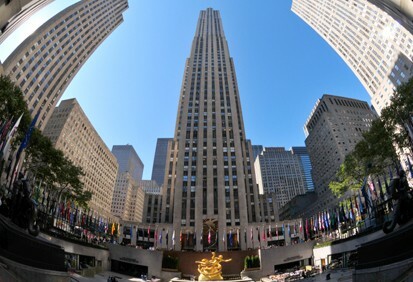 Your journey begins over 80 years ago with John D. Rockefeller Jr.'s unwavering vision for a cultural center and touches upon all the great works of art and architecture that comprise it today. An expert historian will guide you through the Center's most significant buildings, gardens and spaces. Follow along with your own personal headset and enjoy this uninterrupted account through a closed circuit connection. Rockefeller Center will never look the same again! Schedule: Tours are scheduled every half hour beginning at 10AM each morning (excluding 6PM and 6:30PM), 7 days a week.